7am - I've been going over in my mind for awhile how to rework Scampy's gas range top. I've Blogged to you about making the burner grate removable for easy cleaning. That's done. The next thing is replacing the cheap clip that barely is secured to the stainless range pan. I've settled on a wood block to replace that cheap clip. The wood block shall have a threaded 1/4-20 screw that will be used to hold-down the range top. With this "wood block/hold-down screw" in place, it will be sooooo easy to clean the range top after each use. I'm thinking about making a video to show how the range top works after this project is complete. 24 Hour Fitness. The 24 Hour that I workout at is sooooo popular! No room for Scampy/Little Honda to park in their lot. That's why I went there at 10pm a few days ago. This morning I'm giving 10am a try. Home Depot. Buy what's needed for doing the range top project. 5pm - A ton of things! We are at the Super Wash 'n Dry in El Cajon. This is an amazing day for us because we did a ton of things! #2. WalMart Grocery. We were at WalMart grocery shopping within the last couple of days. But we had made a grocery list again. So, we shopped at WalMart again. #3. 24 Hour Fitness. 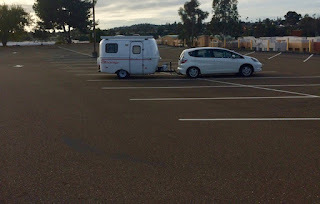 We Blogged to you that MsScampy and Little Honda were not able to find parking space in 24's parking lot. Today was the same thing. No space! Then, we noticed a 24 club member walking up the hill passed the filled up parking lot. We wondered perhaps if there was another parking lot up there? #4. Super Wash 'n Dry. We were way overdue in our laundry chores. So, today we did our laundry. My Cousin Jacky has a son. His name is Paul. I like Paul, and took him out for supper awhile back. A little while ago, Little iPhone rang and it was Cousin Paul! He invited me out for supper. We went to Denny's. We both ordered from the Senior+ menu. And both of us ordered the Tilapia. Good fish! Came with 2-sides and a cup of soup. Paul ordered a salad. This was a very good time for me with Paul! I've Nite Camped here a whole lot on this Scampy trip. Makes things easier because John lets me use his shore power. I've figured a good way to connect to that power. An extension cord goes overhead from a high trellis on John's home to Scampy. The cord goes up after 9pm and comes down before 6am. This is part of our "Stealth" routine. We do not want to attract attention of people in the neighborhood with that electric cord. Hoping you make the video. Sounds as if it would be helpful. Happy New Year, George; love your enthusiasm! I promise! The video will be coming soon. Wood inside a range top? Hmmmm. I would not do it, if it were not completely safe. It turned out that my idea of a wood block was not doable. Maybe square stock aluminum instead of wood. Still easy to drill and screw. No, I disagree. NOT easy to do. Wood is ALWAYS easier to work with than aluminum. Remember. I have decades of experience in a machine shop environment plus five years in a cabinet shop. All that experience tells me that the little wood blocks are VERY safe in this stove location. No flames. Very little heat. My wood block idea did not work out. I am now leaning toward your "aluminum" comment. It seems that a small aluminum angle might be usable. YES!! I love doing chores. And am crazy mad for the opportunity to solve mechanical puzzles. I'm so glad that you are back out and exploring again. Keep going. Are you planning to change your banner to Scampy, Fit, & you? or Ms. Twayler? I am also glad that I am out exploring again. Maybe GLAD is a little mild for the way I feel about it. Perhaps ecstatic would be closer. I am somewhat conservative when it comes to name changing. For example, I still am "Tioga George." MsTioga may be gone to another place. For me, she will always be in my heart. I'll never forget her. Hi George, Couple general ideas for your consideration. Last time I was in the San Diego area I went to the 99cent store and was impressed with how much fresh veggies they sold there. May be a good deal. Second, I have used the PVC trim in several places. It is more suited to wood for some locations. The sawdust is much finer then wood but cutting/drilling is no problem. Take care and have fun with Scampy and all your projects. Thank you! Good suggestion about 99 Cent Store. I appreciate your comment about PVC for the Suburban Stove project.